Most cyclists and triathletes need to replace the insoles in their cycling shoes. The unique thing about Solestar carbon (custom) is that it is a product that was initially designed for professional cyclists by Oliver Elsenbach, who is a German sport scientist specializing in cycling orthopedics. The product has been perfected since ~2007 at the elite level before being made available to anyone else who would like to use it. These insoles are not only for elite athletes, any cyclist/triathlete can benefit from using them. The solestar insole is made from carbon, so it is light, strong and stiff. The material slackens and then returns to its original shape. The principle behind the insoles is that during the push phase of the pedaling cycle, the carbon support prevents the medial collapse of the foot, so there is even force distribution on the entire mid foot axis. During the pull phase, the elevation of the lateral side at the forefoot prevents the foot from losing grip. The insoles are Based on an innovative patented concept called the 'stabilization delta'. Because of its three main contact points, the stabilization delta works like a clamp in the cycling shoe and provides strong support during the pedal cycle. The foot is placed in an optimal neutral position and held there. This is not only about improving power transfer to the pedals, it is also about helping with various imbalances on the bike through adjusting balance through the feet. 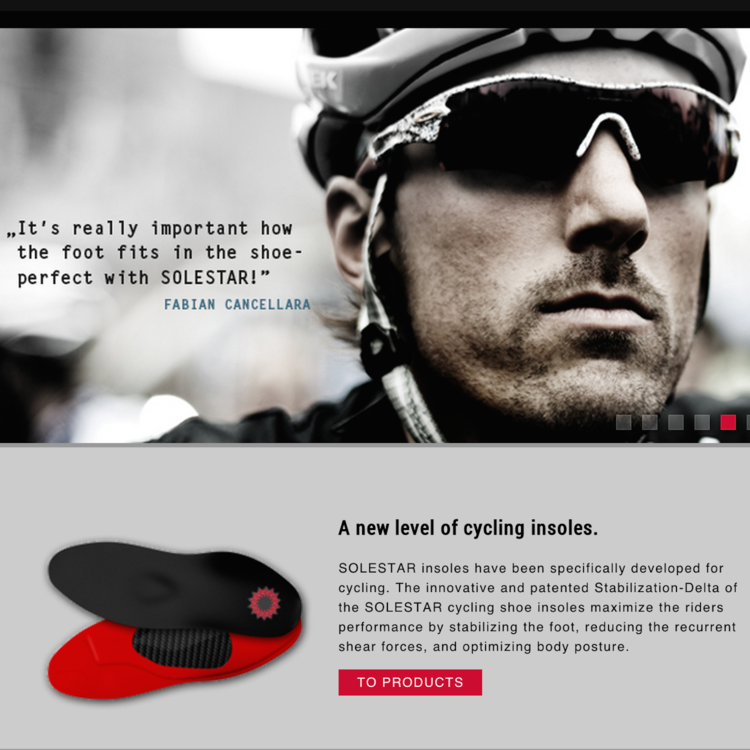 For a good article about cycling insoles in general and Solestar in particular, click here. There are two kinds of Solestar insoles - custom and non custom (called Kontrol). The Kontol insoles have the shelf life of several years, depending on riding volume. The carbon insole is hand-manufactured in Germany and customization is done at Paris Orthotics in Vancouver, BC. Adjustments to the insoles can be made within 6 weeks of purchase, free of charge. Because the Solestar custom insoles affect the way your bike fits your body, adjustments to the fit will likely be needed after your insoles are ready. Because of that, we currently do not offer custom insoles if you have not been fitted by Noa in the past. We take pride in our work and hold ourselves to the highest standard possible, so we want to make sure your insoles fit you perfectly and have the desired effect on your cycling biomechanics. Having Retul files collected before and after as a part of the fitting process, allows us to do just that. The cost is $350 (+gst) if you have been fitted by Noa in the past. If this is your first time working with Noa, the cost is $300, plus the cost of an initial bike fit.